Contact Palm Beach Business.com by phone: 561 450-8258. By email. 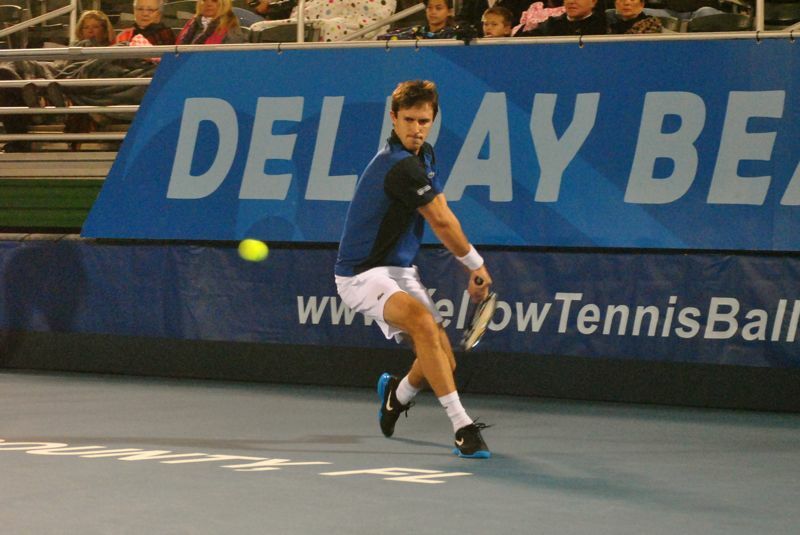 Ernests Gulbis reaches for a shot in his match Saturday against Tommy Haas. DELRAY BEACH — It is as an unlikely a match-up as anyone might possibly conceive for the finals of the Delray Beach International Tennis Championships Sunday afternoon. The tennis equivalent of a Pittsburgh Pirates-Kansas City Royals World Series. Ernests Gulbis of Latvia beat second-seed Tommy Haas of Germany 6-3, 4-6, 7-6(2) Saturday afternoon to earn his spot in the finals, while Edouard Rogers-Vasselin upset top seeded John Isner 6-4, 4-6, 6-4 for his. 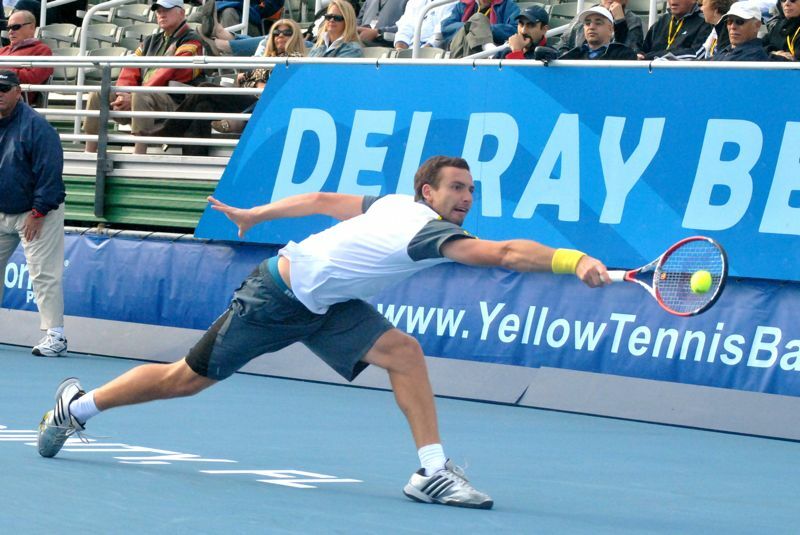 Gulbis, who won the tournament in 2010, came into Delray ranked 109th in the world. He had to survive three qualifying matches just to get the main draw, then had to win three more matches, two against seeded players. Roger-Vasselin, ranked 105th in the world, wouldn’t have even appeared in Delray if it wasn’t for some last minute dropouts that left a hole in the main draw. Saturday against Isner was his first career appearance in a semifinals match. Roger-Vasselin played a clean game against Insner, making few mistakes. He broke Isner’s serve in the opening game of the first set — his only break — but didn’t allow Isner to break back. Isner had 21 aces in the match, and in one sequence, facing triple break point, hit five straight to win the game. But Roger-Vasselin said the key was to be aggressive on Isner’s second serve. “He’s very tall and it’s tough to make passing shots on him, so I decided to go straight to his body,” Roger-Vasselin said. The epitome of that came in the third set. Neither player could break the other, and it became apparent that one mistake could cost either the match. Haas twice had triple break point against Gulbis but both times the Latvian managed to pull his game back together in time to save service. Haas agreed that those two games were the key to the match. Swirling winds that hit as high as 22 mph were a factor during the first two sets, but less so in the third. Both players said the wind made it difficult to play the lines. NOTES: The American team of James Blake and Jack Sock will play Max Mirnyi and Horia Tecau in the doubles final at 1 p.m. … The singles final will begin not before 3 p.m.
Edouard Roger-Vasselin played an aggressive game Saturday to upset top-seed John Isner at the Delray Beach ITC. Keep up with YOUR community. Receive our FREE email newsletters!